Google has picked Austin, Texas, as the second location to test its self-driving vehicles, expanding the trials beyond Mountain View, California. One of Google's self-driving Lexus sport utility vehicles is already on Austin's streets, the company said Tuesday. 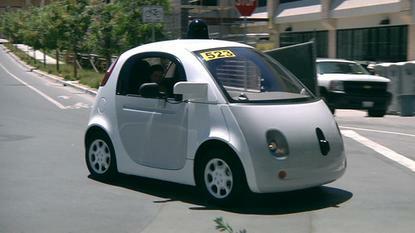 Until now, public road tests of Google's self-driving technology took place only around Mountain View, where the search company has its headquarters. Expanding the trial area will allow Google to test its software in a location with different road conditions, traffic patterns and driving situations, the company said. The new opportunity Bill Veghte quit Hewlett-Packard to pursue has been revealed as the CEO role at online polling firm Survey Monkey, CNET reports. Veghte, until recently HP's software boss, will take over on Aug. 3. Survey Monkey's previous CEO, David Goldberg, died suddenly in May. Goldberg's wife, Facebook COO Sheryl Sandberg, will join Survey Monkey's board. Those tough choices that Satya Nadella referred to in his latest memo to all staff? Turns out that could mean deciding who's next to get a pink slip. The New York Times reports that the company will soon begin a fresh round of layoffs in addition to the 18,000 it announced last year. Will Snowden come in from the cold? The "possibility exists" for the U.S. Department of Justice to cut a deal that would allow surveillance leaker Edward Snowden to return to the U.S., former attorney general Eric Holder says. Snowden, who leaked information about the National Security Agency's surveillance programs, "spurred a necessary debate" about the collection of U.S. telephone records, Holder told Yahoo News. NSA officials have reportedly considered a plea deal for Snowden, including some jail time. But Ben Wizner, one of Snowden's lawyers, rejected the possibility of pleading guilty to a felony. You want robust debate? You got it. The New York Times reports how a panel of eminent encryption experts have explained just why governments should not be given privileged access to encrypted communications. Their views follow a call from FBI director James Comey for "robust debate" about the use of encryption by people on whom he'd like to eavesdrop. A seventeen-year-old Finn was convicted of 50,700 counts of hacking and other offences including credit card fraud in a district court in Espoo, Finland, on Tuesday. The teen's targets included a number of U.S. universities. He was given a two-year suspended prison sentence for his actions. Facebook is working hard to lower the carbon footprint of its data centers -- but what about their actual footprint? It is building a new one on a 110-acre site in Fort Worth, Texas, that will use free-air cooling rather than energy-intensive air-conditioning. Facebook will power the site entirely with renewable energy from a nearby 17,000-acre wind farm it is funding. That's a lot of hosting space! Texting from our smartphones may be killing letter-writing, but Instagram is also fetishizing beautiful handwriting in a new way. The Verge takes a look. That job you're doing? It might be your last. A human at The Atlantic takes a long, hard look at how technology is changing the world of work and making many of us redundant.